We decided that is it time to spice things up a bit around here. 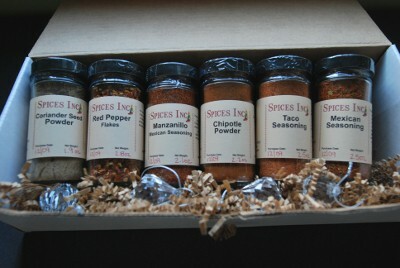 Fortunately, the wonderful people over at Spices Inc have offered to help! 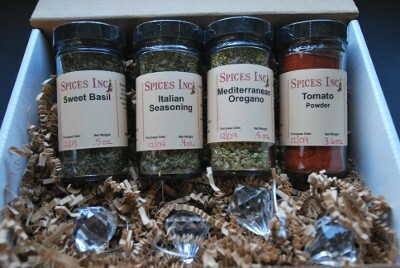 Greg, from Spices Inc has generously given Adam and I the opportunity to giveaway not one but three of their fabulous spice sets! 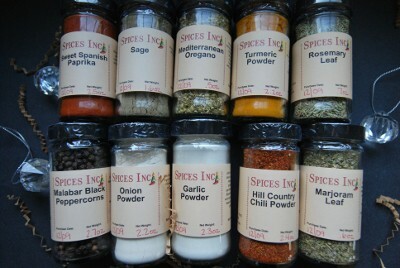 How great would it be to move into 2010 with a brand new selection of spices in your pantry? What is your New Year’s resolution for the kitchen in 2010? 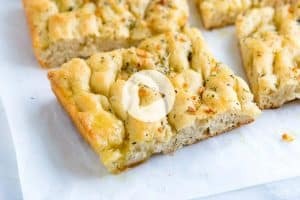 Is there a recipe you want to try or a cooking technique you want to master? Have you always been scared to eat an oyster or try sushi? Maybe you have always wanted to start your very own food and cooking blog…or maybe you are like Julie Powell from Julie and Julia and you decide to overcome your fears and face cooking a live lobster… whatever it is, let us know and you are immediately entered to win one of the following spice sets! Winners will be chosen at random using RANDOM.org. The comment associated with the first number to be randomly generated will receive the grand prize, the second will receive the second place prize and the third will, you guessed it receive the third place prize. 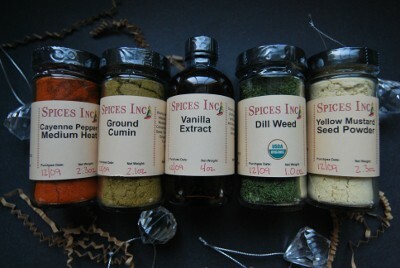 ** All the spices included in this giveaway from Spices Inc are in 1/2 cup jars (except the Vanilla Extract which is a 4 oz jar) and have been sealed, weighed and dated. I resolve to finally start my own food blog! I’d resolve to cook at least one recipe I’ve never cooked before from every cookbook I own. My first goal is to try at least one new recipe a month from the cookbooks in my collection. They’ve gotten a bit dusty over the years as the internet offers so many great, free resources, so either I need to start using them again or send them off to people who will! My resolution for the new year is to learn to how to cook Indian food! I resolve to eat better on a tight budget. My new years resolution for the kitchen is to learn how to make a pie. to cook a turkey!! Happy spicy new year!! My goal in the upcoming year is to take time to make real food–not frozen meals, not fast food–as inspired by the slow food movement. Forty and fifty-hour work weeks can’t be my reasoning for not taking time to learn new methods in the kitchen and eat well with the future wife I love so much. Thanks for the opportunity! My resolution is to conquer my fear of yeast and finally bake bread that is not an embarrassment. Since I was lucky enough to be a winner in your last give away, please don’t count my comment in the contest entries. Someone else should have a chance to win some Inspired Taste goodies but I did want to share my 2010 kitchen goals. My 2010 Kitchen resolution shall be to try ONE new never-before tried ingredient per week throughout all of 2010—52 new ingredients, omg!! 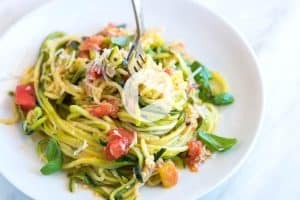 My News Years Cooking Resolution is to learn (and master) several different non-tomato-based sauces (like cheese sauces used as a topping for veggies or pastas)! My kitchen resolution for 2010 is start cooking with real products, get out all the artificial stuff made in a lab. My resolution for 2010 is to boldly go in a culinary direction I’ve never been before. To try different cuisines and take on new taste sensations! My New Year’s Kitchen Resolution: Try one new recipe a week to get out of my cooking rut. 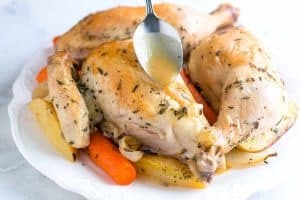 As the mom-figure in a newly combined family (I have one child, he has three), it has become more and more important to me to have healthy, home-cooked meals as often as possible. My kitchen resolution for 2010 is to have dinner together at the table during the weeknights, with all meals being somewhat healthy (read: no chicken nuggets!) and kid friendly. I only recently started cooking (my boyfriend has been the one who cooked almost 95% of the time before) and your website has been very inspirational! My New Year’s Resolution is to perfect puff pastry. I’ll be trying it for the first time this weekend! 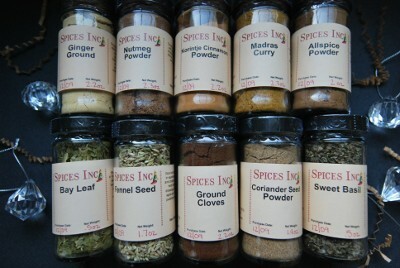 These spices would be great for out kitchen because I’ve always wanted to try cumin! My simple resolution would be to try at least 1 recipe per cookbook I own already.. I seem to be always distracted by all my browsing of the internet! I plan to learn to cook chicken breasts properly. 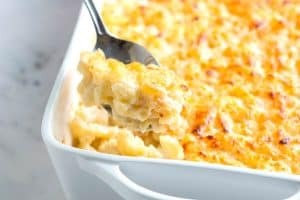 They should be the easiest thing in the world, but I always undercook mine and then have to put them back in the pan. What a great giveaway! My resolution for the kitchen in 2010 is to cook one new dish a week. We always get a few new cookbooks as gifts each year and we read them cover to cover, imagining how the recipes come alive on the plate, salivating over the photos – this year I want to pull out one recipe a week and make it. I am going to bake something new each month in 2010. Thanks for the opportunity!